I put the “WEEEE!” in last weekend, let me tell you what. Friday night Stephen and I went to the Idaho Shakespeare Festival’s “Complete Works of William Shakespeare: Abridged.” Because I am a huge dork, we took theme picnic dinner with us: vegan mac and cheez (because we were seeing fake Shakespeare, we were eating fake mac and cheese, get it?? ), roasted asparagus SPEARS and homemade milkSHAKES (Shakes+spears= Shakespeare! So subtle, but hopefully you can grasp the connection). 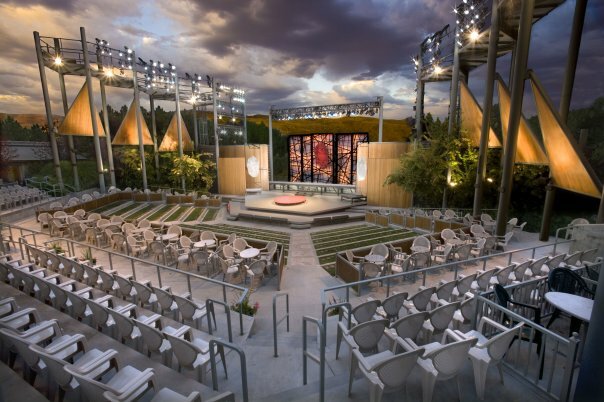 I would have delish looking photos, except they are very vigilant about no pics at ye olde Shakespeare festival (even pre-show, they don’t want you to steal their fantastic set ideas. Or something). So just picture yumminess in your mind, and trust me that it was pure yumminess. "wardrobe malfunction" during our show. Stolen from the ISF's facebook page. The show was really fun, of course, and made for some great flashbacks to the first time I saw it, back at the same Shakespeare Festival when I was a teen. Now I think about 80% of the jokes must have gone over my head back then though, because sheesh. They are all over it with the references. It’s like, Gilmore Girls meets The Simpsons on crack, with the obscure movie quotes and passing asides to pop culture. Jokes about the movie North by Northwest, Stanislavski method acting . . . no way I got those when I was 14. I probably only got 80% of the jokes now, but don’t know enough to know the ones that went over my head. 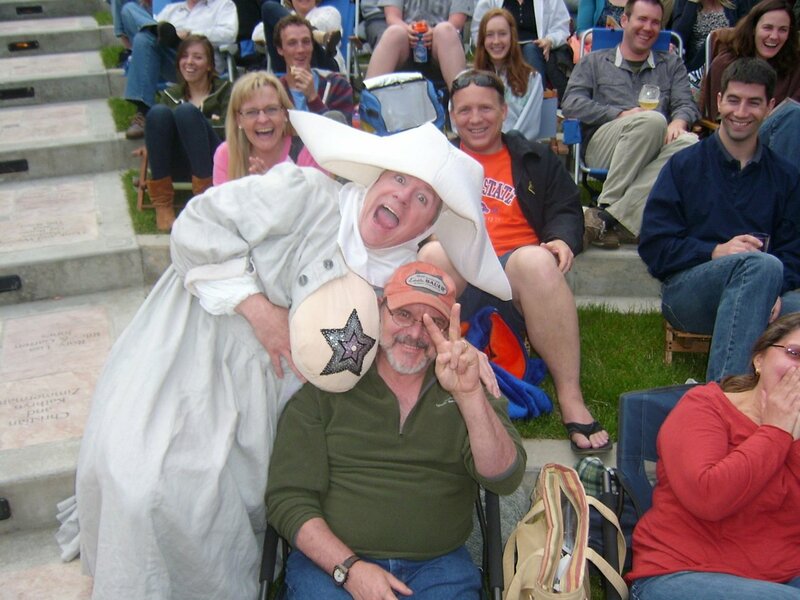 One thing I really love about ShakesFest is that it’s probably the only place in Idaho where it’s guaranteed that you’ll get a cheer if you make an anti-Sarah Palin joke. Oh, also, it was preview night, so tickets were half-price. Holla cheap theater! Isn't it a nifty theater? We were in the second row in the grass on the right. Stephen even got to catch a prop that was thrown into the audience. Breaking the fourth wall! So that was Friday. SATURDAY was fully-packed, and just about perfect. Early morning massage, mid-morning farmer’s market, and afternoon movie matinee. Seriously, doesn’t that sound great? And it was! The massage was through a living social deal that I bought for Stephen and myself way back, it was set to expire in a week or so, so we had to get on that. Stephen had never had a massage, and he was NOT looking forward to it. I practically had to drag his knotted muscled self out of bed. But of course, he loved it, as I knew he would, because it’s a frackin’ MASSAGE for pete’s sake. Even when it hurts (oh, man, I think I have a bruise in my shoulder where one of those knots used to be.) it feels good. 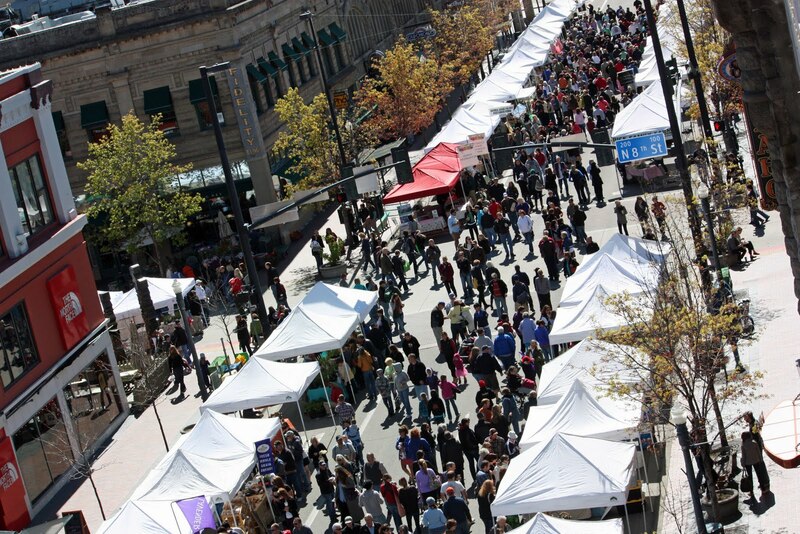 Then since we were downtown and it was beeeeautiful out, we went to the farmer’s market. I love the market. It’s so hustle-y and bustle-y and I swear, everyone there is SO TALL. Something about home-grown veggies must do that. It is the thing about Boise that most reminds me of NYC (though it’s not like there’s a lot of competition for that title). And people bring their dogs, even though it’s not allowed, and for that I am very happy. And of course we had a street crepe and of course it was delicious. And the last M of the day (massage, market, movie!) was Cave of Forgotten Dreams. We were the only ones in the theater, but I was so excited for this movie, I was willing to sacrifice 2 hours of a sunny day. And I am ashamed to say I fell asleep for about ten minutes of it (it was the massage! I was over-relaxed and it was dark!) but what I saw, it was so great. And TOTALLY worth the 3-D ticket. I can’t even imagine how mind-blowing it must be to see that cave in person. Seeing it in the movie detail was amazing in itself. My only qualm is that the narrator mentions in passing that there are two permanent guards to the cave, keeping peoples out since it’s all old and fragile and everything. And I thought that would be a great personal angle: those guards spend their days with the oldest known cave paintings, in one of the most significant historical finds ever. EVER. They stand feet away from the preserved footprints of an 8-year old who walked through that cave a billion years ago (give or take a millenia). What is that like?? Do the guards properly respect the crazy history of the place? Who do they think would win in a fight, a prehistoric cave bear or a prehistoric wolf? And most importantly, what do cavemen ghosts look like? But Werner seemed to disagree with my needs, because the guards were left out. Still and all, great documentary. 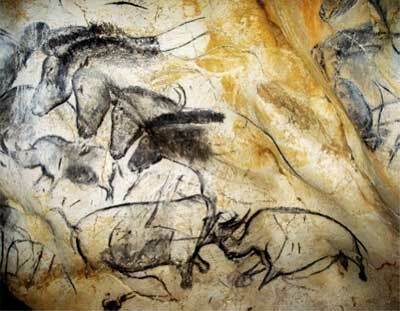 The famous horsies from the cave. I noticed something might be wrong when I saw smoke coming out through the burners. Bit of a warning sign, that. 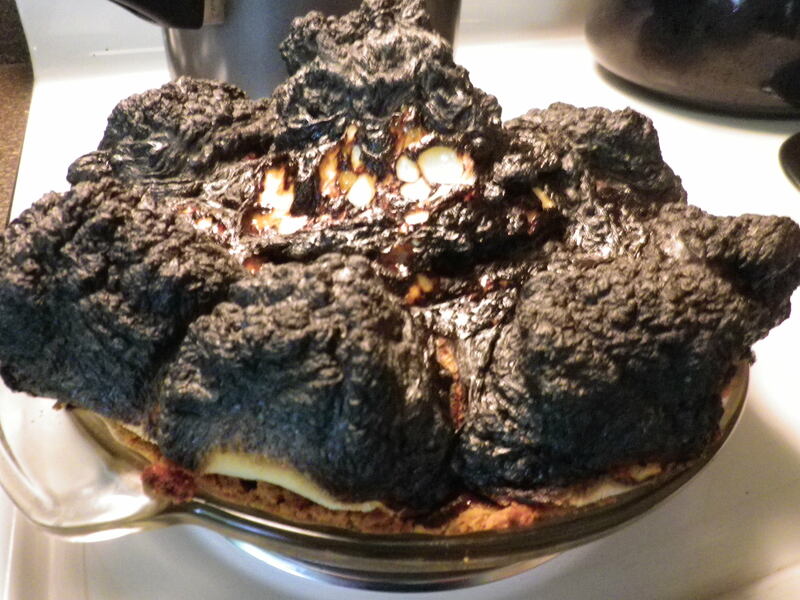 And yes, the pie was ON FIRE. Luckily, Stephen has a lot of experience in blowing out burned marshmallows from his days of camping, so it was ok. And once we scraped off the burned parts, it was actually edible! My first dessert a’flambe! I Am So Fancy. And more than edible, it was really good. But OH SO RICH. Like, I could only eat half-a-slice-every-other-day kind of rich. 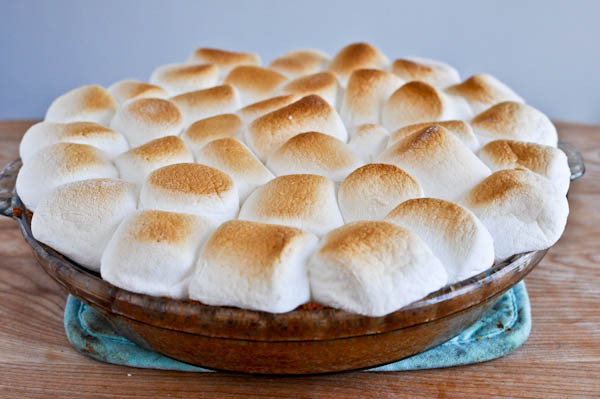 But it really has a great s’moresy taste to it. The melted ‘mallows made it hard to cut, it basically healed itself as soon as you removed the knife. 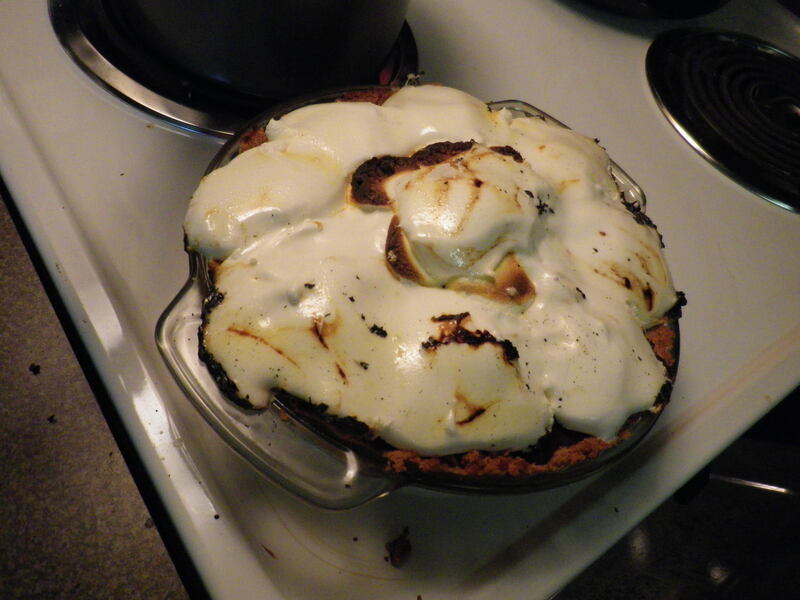 If I make it again I’ll call it a Wolverine Pie for that very reason (s’mores have never been so badass).